The wine growing estate of Peter Sölva & Sons is one of the oldest structures in Caldaro. Since 1731, ten generations have committed and dedicated themselves to the care of their cultural heritage and to the production of the highest quality wines. 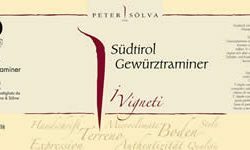 I Vigneti specialize in the native grape varietals Gewürztraminer, Vernatsch and Lagrein. The grapes selected from the vineyards of Oltradige and Bassa Atesina are an authentic expression of South Tyrol and emphasize the versatility of this microzone.